Since their first appearance on 26 January 1977 is more than just a magazine EMMA: It is the best friend of her readers, a national women's information bureau, and - a synonym for the cause. The cause of women. Just a few weeks after the appearance of Power Girl got the nickname of "Emma") misses (or "Alice", according to the EMMA-founder. from 1999, the propagation of the daughters of tags (in good German: Girls' Day: Always on the fourth Thursday in April, etc. ), etc. In its basic position - a full equal opportunities for women and men - EMMA has never let themselves be swayed, not even by the respective zeitgeist. EMMA'S motto: Never trendy, but modern. 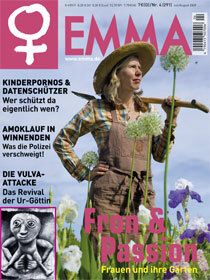 Article, "Happy Birthday, Emma: German Feminist Magazine Turns 30"